Chemical Guys Vintage paste wax with added citrus oils for maximum shine. Created using Brazilian carnauba and natural citrus oils for a bright shine. Crafted using a traditional paste wax formula, our Classic Paste Wax is blended using California grown citrus extracts that enhance gloss and shine. Chemical Guys designed Classic Paste Wax to deliver a show winning shine that protects your vehicle's paintwork. California citrus oils and pure carnauba create a warm, deep shine. 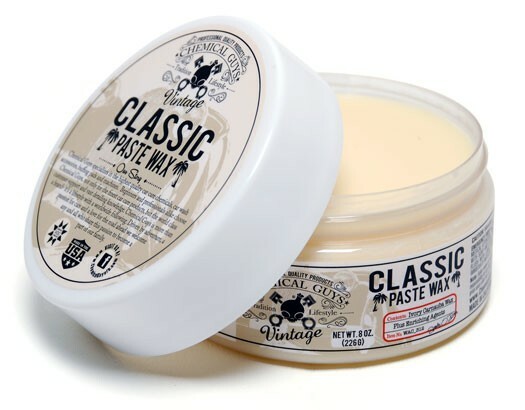 Classic Paste Wax combines detailing passion with all-natural ingredients to create the perfect wax. 2. Towel dry with a microfiber towel. 3. For superior surface coverage and minimal product use, always apply all Chemical Guys products with Microfiber applicators. 4. Always apply very thin coat a little goes along way in a 2-3 square foot area. 5. Once haze has formed, buff gently away with a clean Microfiber Towel. 6. Paste Wax can be applied in as many coats as desired and can also be layered over any glaze, wax or sealant.